For the first time, reptiles have been gene-edited with CRISPR technology. 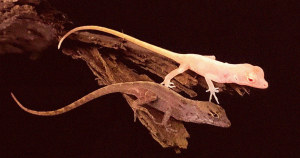 Scientists at University of Georgia bred four brown anole lizards to be albino pink instead of their typical brown, according to New Atlas. The findings show that CRISPR gene-editing tech is more resilient than scientists previously thought. So far, geneticists have shied away from gene-editing lizards because their eggs are particularly fragile — the process of introducing new genes into them is likely to kill them instead. Georgia’s solution: rather than gene-editing a fertilized egg as a CRISPR scientist might with a mammal or other animal, the scientists injected unfertilized eggs and waited for nature to run its eventual course. After 146 injections into 21 female lizards, the scientists ended up with four mutant albinos, according to New Atlas. But the albino lizards had CRISPR-induced mutations not only in the genes they got from their mothers, but also those from their fathers, meaning the CRISPR proteins that caused the gene edits stuck around long enough to also interact with the fathers’ sperm. The discovery that CRISPR proteins are more resilient and long-lasting than previously thought could lead to new human treatments, such as improving eyesight, the scientists behind the research told New Atlas. The post Scientists Gene-Hacked Lizards to Make Them Albino appeared first on Futurism.